1. How I did on last week’s goals: Last week, my goal was the revise my recently completed YA contemp manuscript. I got about halfway through and had all the intentions of finishing when my agent and I had a discussion about it needing a bigger hook to move forward with it. So I paused revisions and have been plotting ever since. I completed a whopping 2 recommendation letters, so not the 3 I was hoping for. I also fell off the wagon a little with the 21 day fix, but stress will do that to you. 2. My goal(s) for this week: Honestly, the only thing I care about right now is finding the elusive “bigger hook.” I *think* I’m on the right track with an idea that will still tell the story I want to tell, but makes it a lot more interesting. I’ve got a little less than 2 weeks until school starts, so at least having a direction and making some progress before then would be nice. I need to have at least 5 letters done this week. And I’d like to stay on the 21 day fix plan as best as I can this week. This is week 3, gotta finish strong. This is THE END. I don’t think it will be changing. 4. The biggest challenge I faced this week (ex. finding time to write): Myself, completely. I get so emotionally attached to what I’ve written that changing gears is really difficult for me, even if I know in my head that it’s totally the right thing to do. I tend to react immediately, and personally, when I really need to take a few days and marinate and wait for all the pieces to click together. This happened to me with the book I got my agent with–I completely changed the ethnicity of a central family in the book and it altered, IMO, the whole feel of the book and made it much more universal. But it took me a long time and waiting for mental clarity to come to that conclusion. Hoping that the direction I’d like to go in is the right one this time too. 5. Something I love about my WiP: That this new idea, this “hook,” might just make it what it’s supposed to be. Oh, that’s such a hard place to be in. Good luck with the plotting. I hope you find just the right hook! I can so totally relate to getting in my own way – getting too attached to what I’ve already written. It’s so hard! Good luck finding that “hook” and making the big changes that need to be made. I know you’ll be happier with yourself in the end! Have a great week. Yay for new direction! And I hope you can figure it all out. Crossing all my fingers and toes for you! Also, I LOVE that ending so I really hope that doesn’t have to change. Hope you have a great week! “I get so emotionally attached to what I’ve written that changing gears is really difficult for me, even if I know in my head that it’s totally the right thing to do.” <– YES. This is so me. Also, I'm horrible at coming up with big hooks. Like, if I had one writerly wish, it'd be that those big, hook-y ideas would start hitting me over the head like they seem to with other writers. If only. 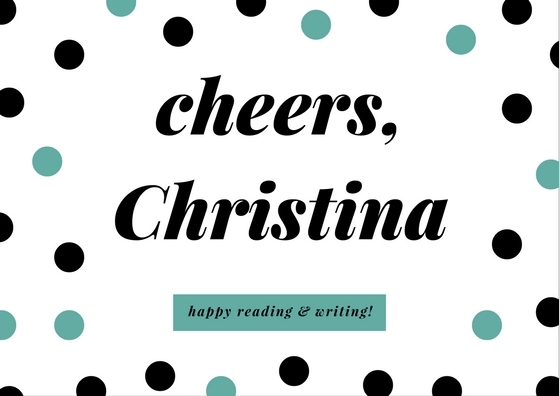 🙂 Best of luck with your brainstorming and plotting, Christina!